Without being oversentimental, we can sympathize with the many experts conned by Piltdown man. And we should keep in mind that Woodward and the others did exemplary work in their sciences. The American paleontologist George Gaylord Simpson, in reply to my inquiry about his views on Piltdown, reminded me that Piltdown was the only great mistake of Woodward's life. Simpson, who knew Woodward, said he was happy that his friend had never known that Piltdown Man was a hoax and disgusted that Woodward is remembered for the mistake and not for his scientific successes (Private communication, September 21, 1984). The find of a second eoanthropine elsewhere, some months after the pit had gone sterile, was a blow to skepticism. As Woodward and Sollas emphasized, a coincidence of human skull and ape jawbone could have happened at one site; but for it to happen again elsewhere strained incredulity. The period between the world wars served up, year after year, one hominid fossil after another, each of which should have sent Piltdown Man packing. Yet his defenders held on with a tenacity that does not evoke respect. What happened between the wars is not complimentary to Woodward, Hooton, Smith, or Keith. At Barcombe Mills, near Piltdown, Dawson found fragments of several cranial bones and a molar tooth stained the same color as the Piltdown remains; but all these were modern. Still, he was lucky or crafty. The Sussex weald is not littered with old bones. When he went visiting other sites with Woodward (as he did in 1914), he never found anything. He did find important things at another site, and they are known, but just where and with whom are not known. In response to an enquiry, Sir A. Smith Woodward states (in let. 28th Oct. 1924) that the situation of this field was never revealed to him, but he is satisfied that it is "somewhere on Mr. John Martin's Netherhall farm ... near Chailey (or Fletching) Common." He also found a fragment of an occipital bone. Seven months later, Dawson casually informed Woodward of a subsequent find at Site II, an eoanthropine molar tooth "just the same as the others as to wear." The booty included a fragment of a rhinoceros molar as well, an index to the dating of the human pieces. In October 1915, Dawson became ill with septicemia, and by February 1916 was to have an injection of serum that he thought would make him "worse, temporarily." The treatment was not successful; he lingered on for another six months and died in August 1916. Throughout this time, Woodward did nothing about reporting the confirmatory find of the new ape-man. On February 28, 1917, he finally announced Dawson's discovery to the Geological Society. Thus, more than two years went by from the time of Dawson's first mentioning the Site II frontal bone to the announcement, while defenders and skeptics bashed each other over Piltdown Man, unaware that another waited in the wings to play out his filial role. In his "Fourth Note on the Piltdown Gravel, with Evidence of a Second Skull of Eoanthropus dawsoni" (1914, the year the pit went sterile), Woodward shaped the isolated molar tooth into a weapon against Miller. Comparison of this new tooth with corresponding molars of "a Melanesian, a Tasmanian, and a Chimpanzee, of approximately the same  size" showed that it was essentially human. The portion of frontal bone was as thick as the comparable piece from the Piltdown pit's cranium. Grafton Elliot Smith composed an appendix for Woodward's paper on the endocranial cast of the Piltdown skull. Meticulous Ray Lankester demurred again. He thought it possible that the piece of frontal bone and the molar had come from the same individual whose cranium and jaw had been found in the pit. He did not speculate on how the pieces had traveled. If there is a Providence hanging over the affairs of prehistoric men, it certainly manifested itself in this case, because the three minute fragments of this second Piltdown Dawn Man found by Dawson are exactly those which we would have selected to confirm the comparison with the original type, namely: (1) a first lower molar tooth, (2) a bit of bone of the forehead near the right eyebrow, (3) the middle part of an occipital bone of the skull. Both the grinding tooth and the eyebrow region are absolutely distinctive. Placed side by side with the corresponding fossils of the first Piltdown Man they agree precisely; there is not a shadow of difference. No story in the history of anthropology, Osborn exclaimed, is more praiseworthy than that of the Dawn Man of Sussex. In his mea culpa for past infidelity he said he had been wrong about the canine, too-that belonged to the lower jaw; he had been wrong about Woodward, and Woodward could have said, 1 told you so. Osborn settled on Piltdown as closer to the human line than was Neanderthal (Osborn, 1928). In 1922, Osborn interpreted a single tooth found in Nebraska as that of a new anthropoid, which he named Hesperopithecus haroldcookii, and which turned out to be the tooth of a prehistoric pig (Blinderman, 1985). In that year, too, George Grant MacCurdy, who was at our last view of him an ally of Miller, went on his pilgrimage to South Kensington. 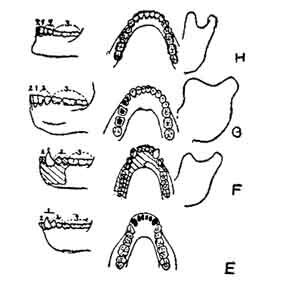 Although repeating his dictum that "association can never be made to take the place of articulation," he now contended that "the Piltdown lower jaw is seen to be intermediate between the lower jaw of Heidelberg and that of a young chimpanzee." What led him to this revision was the improbability of another accidental association of parts at Site II; association at two different sites can be made to take the place of articulation. As for the simian shelf that had not appeared in any hominid jaw before, well, "one must invoke a wider range of individual variation within the genus Homo (Eoanthropus included) than has hitherto been considered ample" (MacCurdy, 1924). Piltdown Man, Jr., also converted William King Gregory (Gregory, 1929). In 1924, upon retiring from the British Museum of Natural History, Sir Arthur Smith Woodward bought a home in Haywards Heath, Sussex. From his home, Woodward wandered out to the pit, dug, sifted, and satisfied his nostalgia for the gravel by peering at it through a magnifying glass. The Piltdown romance still had powers to charm. It had been a splendid episode, the hours of hard labor rewarded by the excitement of another bony fragment, the friendship, above all the putting together of pieces of a missing link so credible that opposition like that of Osborn, MacCurdy, and Gregory shook in its foreign boots. Woodward often talked with the novelist Ernest Raymond about the good old days, about the "brown old coconut" that had grown into so fruitful a tree. H. G. Wells had estimated in his Short History of the World that by 1920 more than a hundred papers and books had discussed Piltdown Man. The Sussex hominid may then have received as much attention as all other fossil hominids put together. Woodward fondly recalled that time when a member of a Lewes audience, upon being shown a slide of Piltdown Man, shrugged away the wondrous creature with a "You could meet chaps like that in Lewes any day." Though Sir Arthur persevered for years with his pick, his sieve, and his magnifying glass, the pit had gone out with Dawson. Woodward and Raymond found an unremarkable trilobite and a bone fragment of some contemporary animal. Seven years after he had moved to Sussex, Wood ward found a sheep's tooth. Party Politician: "See how even in this distant progenitor of ours we may trace those traits which, evolving through the ages, reach their almost divine development in us." No books entirely on Piltdown Man came out in the 1920s (or 1930s), but he was a minor object of attention in the third and expanded edition of Sollas's Ancient Hunters (1924), a little more important in Smith's The Evolution of Man (1924), and still the major character of Keith's The Antiquity of Man (2nd ed, 1925). These books, of course, all upheld him. But attacks were coming from two directions: from fundamentalism and from science. In the scientific community, from 1917 to mid-century some investigators continued the approach that Miller had taken in performing an autopsy upon the remains. More important, however, were fossil hominid finds that showed Eoanthropus to be not an anomaly, but a mistake. Priority in a public statement that Piltdown Man was a hoax may go to an American fundamentalist. The Bible not only does not say anything about transmutation of ape into human being; it explicitly rejects the theory that kinds (or species) can evolve into other kinds. Apes are apes and people are people, and an ape-man is as incredible as a merman. Who would want an ape or an ape-man for an ancestor anyway? Apes could be seen at their disgusting antics in any zoo. And people of the first generation of the twentieth century had many examples of what we would be like if we had that depraved ape within us, examples (a small selection) from Tennyson, Robert Louis Stevenson, and the Italian criminologist Cesare Lombroso, who scientifically proved that the ape throbs in the atavist of enormous jaws, strong canines, and prognathous snout, prognathism appearing in 95 percent of criminals. The ape-man crawled his way from a cave in the Neander valley through a descriptive paper by T. H. Huxley, who once publicly claimed that he would prefer to have an ape for a grandfather than a certain bishop, into Lombroso and out of Criminal Man into the novel McTeague by Frank Norris. The hero's jaw is "salient, like that of the carnivora." Fighting teeth are the central symbol of this naturalistic novel. Trina's birthday gift to McTeague is a "tooth of a gigantic fossil, golden and dazzling," hung outside as an advertisement for the dental office; in a brawl, a character bites McTeague's earlobe; and McTeague himself, to extort money from Trina, to punish her, or just for the sheer joy of it, bites Trina's fingers so zealously that they have to be amputated. Piltdown Man's features, a thick skull, a prognathous jaw, and fighting teeth, made him the darling of the evolutionists, but the bête noire of the fundamentalists, for whom an ape-ancestor lacked sects appeal. Seemingly, it is taken for granted that the disgraceful history of the Piltdown Man. . .has been so far forgotten as to make it safe to present his "restoration" to this generation as a gentleman of quality rather than as the discredited hoax he has been shown to be. . . .With these fragments, which a juggler could conceal in the palm of one hand, the scientists "reconstructed" the Piltdown Man. He didn't follow through on this. Had he done so, the scientific community would have ignored him anyway. Like fundamentalists before, then, and now, McCann relished playing evolutionists against one another, a ploy irritating to evolutionists. He refers to W. D. Matthew, Ales Hrdlicka, and, of course, Gerrit Miller, in his contention that the jaw is that of a newly discovered species of extinct chimpanzee. It had never been used in human munching. "The Piltdown remains," McCann generalizes, and one cannot fault him on this, "disclose the ease with which 'missing links' between apes and men can be fabricated by resort to wide stretches of imagination in support of preconceived opinions." Remains brought from pit and field stimulated the defenders of Piltdown Man to stretch their imagination in fitting together what really did not fit, geologically or anatomically. Similar nimbleness was called for from the 1920s to the 1940s because of the discoveries of new hominid fossils, australopithecines from Africa, more pithecanthropines from Asia, a specimen of uncertain genealogy from Sussex, and many Neanderthals. All of these were incompatible with Eoanthropus. These hominids should have posed a fatal challenge to Eoanthropus. But as they were dug up, one after another, the further discussion that skeptics had called for was constantly postponed. Defenders of Piltdown Man declined to give up their defense. Instead, they either said nothing or made up stories. It is so awkward an episode that even an evolutionist can feel a twinge of respect for McCann's diatribe. First the finds, and then the stories. Of minimal importance during these years was the unearthing of a female skull in excavation for the construction of a new Lloyd's of London building. With four cranial fragments were found, and exhibited in March 1925, mammoth molar teeth and a femur knob, a rhinoceros ulna, pieces of a red deer, and part of an ox skull. In the same year, far from the City of London, far off in southern Africa, Raymond Dart, a former student of Grafton Elliot Smith, met the Taung baby. Although only the lower jaw and the front part of a skull, this David would make the Piltdown Goliath tremble. In his paper on Australopithecus, Dart described the southern ape as more human than was Eoanthropus, whose simian shelf "scarcely differs from the anthropoids." Dart did not solve, nor introduce, the obvious problem that this raised: Australopithecus had a cranium like an ape's, but a jaw more human than Piltdown's. The idea held by so many, that the earliest hominid would have a large brain and an apelike snout, was precisely reversed by the Taung tot. Teilhard de Chardin was in China with Davidson Black, also a former student of Grafton Elliot Smith. Teilhard had been centrally involved with Piltdown, Black peripherally. (In 1914, he had found a piece of rhinoceros tooth in the pit.) Along with an international crew, Teilhard and Black went spelunking in Choukoutien, outside of Peking, and uncovered a population of Sinanthropus pekinensis, which resembled (and ultimately would be incorporated with) Pithecanthropus erectus. The eoanthropine arrangement consisted of an apelike jaw and a very human cranium. The australopithecine arrangement consisted of a humanlike jaw and an apelike cranium. The sinanthropine arrangement consisted of fully human leg bones, human dentition, and a cranium not fully human, but football-like, vaulted as though it were from one of Lombroso's criminals. Something was very wrong with all this. Near Dartford, on the south bank of the Thames, in 1935 and 1936, a dental anatomist named Alvan T. Marston dug up a hominid occipital and left parietal, Elephas relics, and hundreds of flint implements. Stratigraphic analysis led him to conclude that the hominid, called Swanscombe Man, had lived 225,000 years ago and thus was "definitely a precursor of the Piltdown type." But the skull seemed to be Homo sapiens. It didn't make much sense, however, to place the more primitive Eoanthropus, with its apelike jaw, as having lived later than Swanscombe Man. From 1937 onward, Marston kept demanding that an inquiry be made into the status of the Piltdown skull. Suspecting that the canine had come from an ape's jaw, he conducted the outrageous experiment of fitting the canine into an ape's jaw. It fit. He went on to say that the mandible was just like  that of a female orangutan. The new hominids did not sufficiently impress the pro-Piltdown party. When attacked, this party simply affirmed the humanity of the specimen from Piltdown and denied it to the specimen from Africa and sometimes even to the specimen from China. A typical example of this response is The Pedigree of the Human Race, by Harris H. Wilder, professor of zoology at Smith College. Wilder's knowing of Dart's finds failed to stop him from criticizing Miller for dissociating cranium and jaw. There was the Taung baby with its humanlike jaw. And there was Piltdown Man: "Any ape-like characters of the jaw, although extremely interesting, are to be expected." Wilder's book appeared in 1926, a bit early for anyone to have grasped the full impact of the new finds. But as late as 1931, when ignorance of the new finds could no longer be an excuse, Earnest Hooton chivalrically came to the aid of a lady under siege. "Dame Eoanthropus: The First Female Intellectual," a chapter of his Up from the Ape, traces the story of the finds; calls the elephant thigh-bone artifact remarkable; expresses agreement with Lewis Abbott, "an authority on the geology of the Weald," on dating the remains as Pliocene-Pleistocene; concedes that the jawbone has a simian shelf and that the canine tooth is like that of a female chimpanzee; and goes on to justify the unity of cranium and jawbone. The incongruity of the jawbone's made-up condyle with the rest of the piece is only a little difficulty. The "Piltdown Lady" had acquired "a big brain without losing anything of her jaw worth mentioning." Hooton thought that the Piltdown Lady was more like the ancestral form of European grand dames than anything so far discovered. Robert Broom and Louis Leakey found more australopithecines. Broom as late as 1950 still believed that Eoanthropus was a unified being, its simian shelf an example of convergent evolution. Leakey used Piltdown Man for calibration of his fossil finds, for example, on the prolongation of nasal bones (though he would later claim he knew Piltdown Man was a hoax). Were we to anticipate Sir Grafton Elliot Smith's changing his mind, we would be disappointed. The cerebellum of the Lady of Lloyd's, he admitted, was like that in Homo sapiens "as well as, curiously enough, in the Piltdown cast." This additional example of the Piltdown cranium's total humanity meant nothing. Smith comes back to Piltdown Man in The Evolution of Man (1924), Search for Man's Ancestors (1931), and Discovery of Primitive Man in China (1931). Smith took cognizance of the profound skepticism of German anthropologists who "have either refrained altogether from referring to the Piltdown discovery (which obviously is of crucial importance) or have stated that the issue is so doubtful as to be excluded from the argument." In a review, he generalizes on "the widespread suspicion of the authenticity of the Piltdown Man as a valid genus," the "chief reason for the lack of agreement in human palaeontology." The specimen is not heavy in weight nor massive in structure; it is marked in fact by relatively moderate build, strikingly at odds with both the first and second Piltdown skulls which in all their parts are decidedly thick. There is no perceptible correspondence between the jaw and the skulls. But, then, its molars were like those of modern humans, or fossil humans, or Dryopithecines. As for Site II, perhaps some mistake had been made. The isolated molar seemed to have come from the Piltdown jaw itself. Like Lankester, Hrdlicka did not speculate on how the pieces had gotten from Piltdown to a site elsewhere. He was also concerned about the circumstance that "neither the skull fragments nor the easily damaged nasals or turbinal show injuries or wear from being rolled in the gravel. Neither are there any gravel marks on the pieces of the second cranium." Like so many others, Hrdlicka came close to whispering fraud, but said, "Here is an enigma which needs, it would seem, some further discussion." Unfortunately, he was not himself prepared to give it that further discussion. In fact, as Frank Spencer points out, he "surprisingly accepted the jaw as an authentic fossil whose morphology was commensurate with its suggested geological age" (Spencer, 1984). 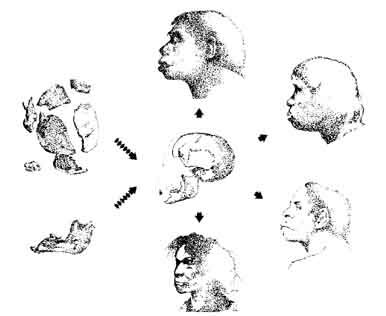 No one has attempted the monumental task of working out the damage done by Piltdown Man as scholars whose names are unknown to us, and middle-level scientists such as Professor Wilder, and those at the top of the hierarchy, such as Hooton, Smith, and Keith, tried to design a rational scheme of human descent by calibrating the new hominids on how well they lined up with the faulty yardstick of Piltdown Man. A  couple of examples will indicate what I mean. The Piltdown specimen having proven that an ape jaw could function in a human skull, Smith mistakenly imposed simian features upon the pithecanthropine jaw. One of the world's leading primate anatomists thus was deceived by Piltdown into making a gross anatomical error. To almost everyone else, it seemed clear that Peking Man is cousin to Java Man. But Smith maintained that Peking Man is cousin to Piltdown Man. One of the world's leading advocates of evolution was thus led by Piltdown into making a gross theoretical error. Giving Piltdown Man a relative would serve to substantiate his reality. Arthur Keith, correctly and temperately enough, expressed doubt about the alleged consanguinity between Peking Man and Piltdown Man. This treason, as Smith saw it, so angered Smith that he wrote he would hesitate to use Keith's book in his courses. Their estrangement was complete. 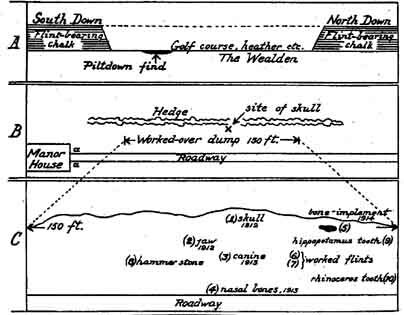 One more example of how following the Piltdown will-o'-the-wisp led Smith to stumble into error is provided by a geological revision of the age of the pit. A resurvey of the River Ouse in 1926 showed that the terrace on which the pit is located had been formed after the Pleistocene. This meant that Eoanthropus was contemporaneous with the post-Pleistocene hominids entering the human family. But none of those had a jaw like that of Eoanthropus. This again should have induced Grafton Elliot Smith to give up his disastrous trek after Piltdown Man. But it didn't. Palaeoanthropology was plunging into incoherence because of Piltdown Man. Here's Smith's response to that: "The tempting task now for the first time becomes possible of achievement, of creating a solid and coherent foundation for a real science of human palaeontology." English texts of the 1920s accepted Piltdown Man as authentic, for example, M. C. Burkitt, Prehistory (1921), and E. Cecil Curwen, Prehistoric Sussex (1929) and The Archaeology of Sussex (1937). In his books, Curwen subscribes to the accepted Piltdown story, as does J. Reid Moir in The Antiquity of Man in East Anglia (1927), which, while asserting that the Piltdown find "is of great importance," devotes only one page to it, and in that page notes that the canine teeth stick up above the level of the molars, a simian rather than human feature. But the voice of skepticism, with a pronounced German accent, continued to be heard in the scientific literature. The German articles blackballing Piltdown Man's application to the club of Menschenwerden tend to be long. Heinz Friederich's Schaedel und Unterkiefer von Piltdown (Eoanthropus dawsoni Woodward') in neuer Untersuchung (1932), 62 , finds insupportable the evidence for the belongingtogetherness of cranium and skull [Ed. note: jaw] : the cranium is entirely human and recent; the jaw stands in the closest proximity to that of a female orangutan and should be named Boreopithecus dawsoni. The introduction to this book was by Franz Weidenreich, who agrees with its skeptical propositions. The next year, Hans Weinert published his Das Problem des "Eoanthropus" von piltdown, 76 pages comprising a perfect study in confusion. Separating the fossils into human skull and ape lower jaw would be a comfortable solution; but they belong together. How can one explain that simian lower jaw? By labeling it a throwback, that's how. Weinert brings up a more sensible explanation of similarities between the cranial fragments of the two sites: those assumed to have come from Site II really came from Site I. Someone goofed in the inventorying. the fossil skull of Piltdown, 1912-1913. We now know that when the Piltdown type was being evolved in England-or at the Western end of the Old World-a totally different type had come into being in the Eastern lands of the Old World. The Eastern types had low receding foreheads, modelled as in the gorilla and chimpanzee. The Western or Piltdown type differed; it had a relatively upright and high forehead, modelled not on gorilla lines but rather on those of the orang. While the Eastern forms retained in their shape of head the low squat type of the chimpanzee and gorilla, the Western or Piltdown type tended to assume the higher vaulted skull seen in modern races. There is no denying that in many of his features Piltdown man foreshadowed some of the structural modifications we find in modern races of mankind. The Nature article on the unveiling quoted Woodward as happily speaking of the discovery's "growing in magnitude and importance." While the Piltdown pit was receiving the homage of a nation in the summer of 1938, Keith completed his final reconstruction of the skull. He underlined the skull's apelike features as though no one had ever done that before. 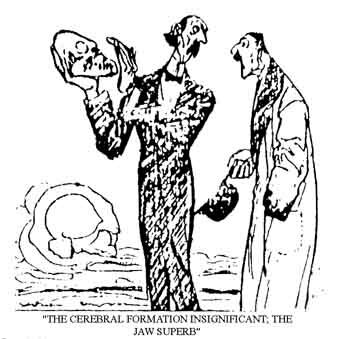 In 1939, he wrote that he had nothing to add to his 1915 conviction that the skull and mandible formed part of the same head, except that he was, after 24 years, more firmly convinced of that. In 1937, Weidenreich had compared radiograms of the Piltdown jaw with that of an orangutan. In 1946's Apes, Giants, and Man, Weidenreich wrote, "All that has been known of early man since the discovery of the Piltdown fossils proves that man cannot have had an ancestor with a lower jaw of a completely simian character." The skepticism that had irked Grafton Elliot Smith grumbled into sarcasm under Weidenreich. Dawson had died in 1916; Abbott in 1933; Sollas in 1936; Smith in 1937; and Woodward in 1944. As new hominids came on the scene, new scientists were there to greet them. Marston in 1947 pointed out that potassium bichromate could effectively alter the gray-tan of cranial bones to the rust of fossils. In 1948, Woodward's The Earliest Englishman was published. In his introduction to this memoir of the Piltdown saga, Keith came out again for the integrity of the fossils, though he also said, ominously, "The Piltdown enigma is still far from a final solution." By 1949, Marston was demanding, "Let the mistake be recognized-let it no longer be defended." In 1950, Keith, in his autobiography, proclaimed Eoanthropus as the most important and instructive of all ancient homiids, its authenticity beyond question. Ecce Homo? After Woodward assembled human cranial fragments and an orangutan jaw into Piltdown Man, artists fleshed out the reconstruction: from top to bottom of crescent, these portraits are adapted from A. Forestier, Illustrated London News (1912); J. H. McGregor, in Osborn (1915); A. S. Woodward (1948); and Maurice Wilson, AP (1951), two years before the exposé disassembled Piltdown Man. A year after the publication of The Earliest Englishman, an inquiry began that would uncover what Lyne, Waterston, Miller, Hrdlicka, Boule, Marston, Friederichs, Weidenreich, the Taung baby, Peking Man, Swanscombe Man, and Neanderthals (from Rhodesia, Palestine, the Crimea, Spain, from France's Fontechevade, Germany's Ehringdorf, Yugoslavia's Krapina, Italy's Saccopastore and Quinzano, and a Neandertalnik from Teshik-Tash, U.S.S.R.) had failed at, the final proof that Eoanthropus was not earliest, not English, not man, and not even real.